When Alphonse was seven years old he went into hiding with his parents and three younger brothers. Trying to avoid being killed, the family did the best they could to survive in the bush. After the genocide, Alphonse and his brothers ended up in a Seventh-day Adventist orphanage. The orphanage had 115 children—all of whom had lost their parents during the genocide. “We were given everything we needed,” Alphonse said. “Food, clothes, notebooks, school fees. I was happy being together with other children who had the same problem as my brothers and me. Being together we started forgetting what had happened to us. “The owners of the orphanage brought us people who were like our parents. We called them mother and father, and we called the other children our brothers and sisters just so we could feel that we had a family. We felt as if we were living in a normal family. We had worship together, fetched water, and did many other normal things that are done in a family. On Friday evenings and Sabbath, we had rest, worship, praying, and so on. We also had a beautiful choir, and even recorded some CDs. After leaving the orphanage, Alphonse met the new director of the Mugonero Hospital—a Brazilian man—who invited Alphonse to work for him as a secretary and translator. Later, Alphonse went for further training and returned to Mugonero Hospital where he now works as the public relations and customer care director. In 2012 Alphonse married. He and his wife, who works as a charge nurse at the hospital, have two sons. Like Alphonse, Sebageni was orphaned during the genocide, but he and his two brothers survived. “We lived in the western province,” Sebageni says. 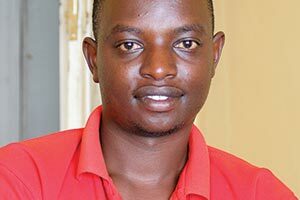 “My parents were Seventh-day Adventists, and my father worked at the Adventist University of Central Africa (AUCA) when it was located on the Mudende campus. My parents and grandmother were inside a building at the university when the killers burned down the building with many people inside. “After our parents and grandmother were killed, we lived with our aunt who came from the Congo. After finishing secondary school, I received a scholarship from the government of Rwanda for genocide survivors. I took chef’s training and worked as a chef for four years. “In 2014 AUCA offered free tuition to those whose parents were killed while working on the Mudende campus. Now I’m now studying business administration at AUCA on the new campus in Kigali. “I’ve chosen business because that’s the career where many people forget Jesus, and I want to help them. If I take theology, there are already many pastors. But when I go into business, I can share with those who don’t know the Bible well. “This is a special verse to me,” says Sebageni. “In 1994, although millions were killed, I’m still alive. Although our parents, our families, have died—it isn’t eternal. They will be resurrected. God can give them back to us. 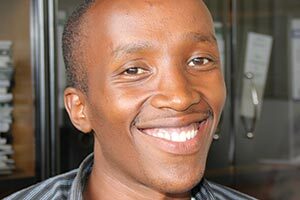 Sebageni plans to help others in the business world know Jesus. “Helping others is important—it’s the importance of love,” he says.